Quinton Patton’s five total catches in the 2013 regular season and postseason aren’t enough to proclaim the young wideout a sure-fire success story. The sample size is small. He played just six games in the regular season, sidelined by injuries, and was active for all three postseason games. But heading into the 2014 season, it appears Patton has impressed his coaching staff and teammates with what he did with the opportunities he had in games, practices and the classroom. Going forward, the 6-foot, 204-pound wide receiver from Louisiana Tech should be part of the Niners’ bigger picture next season. Harbaugh made that comment after Patton made a clutch 23-yard reception late in the final regular-season game against Arizona to set up a game-winning field goal by Phil Dawson. Although he had just two catches in that game, Patton – playing as the No. 3 wideout behind Michael Crabtree and Anquan Boldin – was also praised for his blocking that day. He had a couple of key blocks that helped the 49ers net first downs. To the 49ers coaching staff, that means a lot. 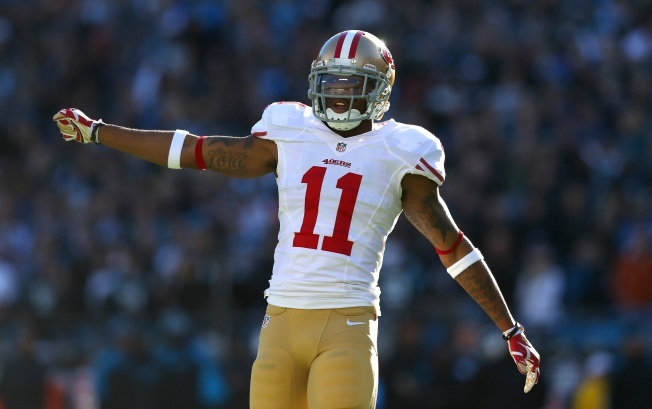 Patton took the place of injured Mario Manningham as the No. 3 receiver late in the season, and has the inside track on the spot for 2014 with Manningham not expected back. Though the 49ers are certain to go after a speed-type wideout in the draft to help stretch the field and give Kaepernick more deep options, that rookie – whoever he is – would likely join the mix of Crabtree, Boldin (a free agent who is expected to be resigned) and Patton. Special teams ace Kassim Osgood, a wide receiver, could also be part of next year’s corps, as could Jonathan Baldwin, acquired from the Chiefs just before the season. Osgood consistently made big plays all year for San Francisco. Now, Patton wants to make this offseason count. He and Kapernick are planning to work out together in Miami this offseason, and Patton also has told reporters he’d like to work out with Boldin as well. Kaepernick made an instant connection with Patton in summer training camp. Though Patton had a hand injury early in camp – he ran routes in practice but wasn’t allowed to catch the ball – once he was cleared for full activity, Kaepernick liked throwing the ball to him. Niners Should get Boost From Two "Redshirts"
In Patton’s debut in the exhibition season, in a 34-14 win over the Vikings, he had a team-high four catches for 35 yards, including a 5-yard touchdown reception from Kaepernick. After the 49ers’ disappointing loss to the Seahawks in the NFC Championship Game, Patton tweeted how thankful he was for his rookie season – even though the hand injury and then a broken foot kept him on the sideline for much of it.